I have a piece of antique Masonic jewelry that I would like to know more about. It belonged to my great-grandfather. 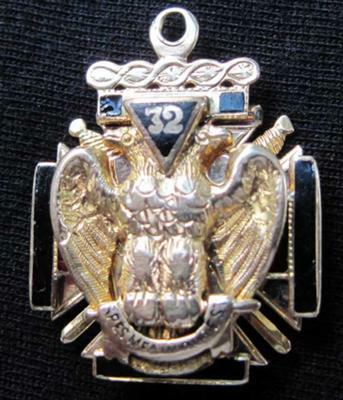 Barbara, this piece is a York Rite and Scottish Rite pendant. Members of Freemasonry receive their first 3 degrees, that of Entered Apprentice, Fellowcraft and Master Mason in a craft lodge (nicknamed a "blue" lodge in the United States). Upon becoming a Master Mason, the member may wish to continue their Masonic education and join the York Rite and/or Scottish Rite branches of Freemasonry. It appears your great grandfather was a Master Mason who was also a member of both of these Rites, which are also called appendant bodies of Freemasonry. The Scottish Rite branch confers an additional 29 degrees. It appears that your great grandfather attained his 32nd degree within the Scottish Rite. 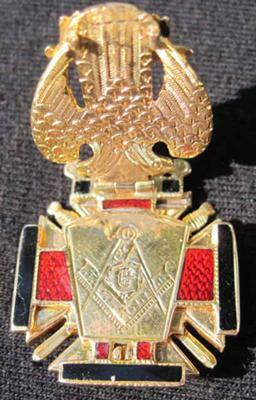 The emblem of the Scottish Rite is the double headed eagle. The York Rite confers a different set of additional degrees. 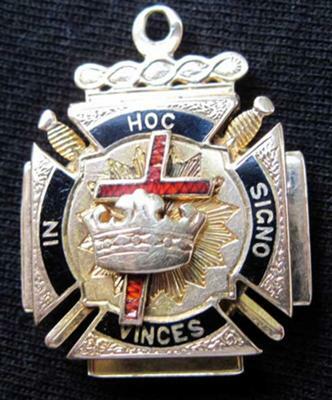 This pendant displays the cross and crown, one of the emblems of the York Rite on whose Grand Standard of a Commandery of Knights Templar can be seen a blood-red Passion Cross. In the American branch of the Order of Knights Templar, In Hoc Signo Vinces is a Greek for: "By this sign thou shalt conquer", an allusion to the original Knights who guarded the Temple, from whence this Order originally received its name. I have a York Rite pocket watch fob with small rubies in the "blood cross" & a knights helmet at the top. Any idea how old this might be or what this fob could mean for my dad's uncle's roll with the Masons? PS. How do I add pictures? It's very easy to upload a photo from your computer to this page. Download photos from your phone or camera to your computer. Name the photo and save it on your hard drive. Remember where you saved it, such as in your Desktop folder or in your My Documents folder or your My Pictures folder, etc. Then, go back to this page where you added your comment, above, and click the Browse button. It will open up possible folders...places on your computer (Desktop, My Documents, etc.) where you just saved your photo. Browse to find the photo and click on the photo and it will upload to the comment page.